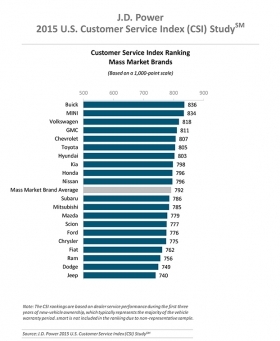 General Motors again dominated the top rankings in customer satisfaction at dealership service departments, claiming three of the five highest-scored mainstream brands in a benchmark study released today by J.D. Power and Associates. Buick held onto its highest-ranked mainstream brand title, while Jaguar soared to the top of the luxury category for the first time since 2008. Overall customer satisfaction slipped, but satisfaction for recall work jumped 12 points. Buick was named top mass-market brand for the second straight year in Power’s U.S. 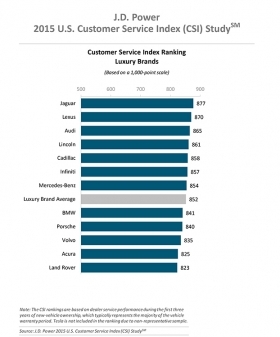 Customer Service Index Study, scoring 836 on a 1,000-point scale. But Mini trailed closely behind, earning a score of 834. Volkswagen followed, and GMC and Chevrolet finished in the top five for the fifth consecutive year. Recalls were considered repairs in Power’s study, Mike Battaglia, senior director of auto retail, said in an interview. GM, in the wake of its ignition-switch recall crisis, recalled an all-time record 26.9 million vehicles in the U.S. last year. As a whole, the industry recalled more than 60 million vehicles last year, nearly doubling the previous all-time record. The study measured customer satisfaction with service at franchised dealership service centers for maintenance or repair work, a statement said. J.D. Power fielded the study between November and December 2014, based on responses from more than 70,000 owners and lessees of 2010-14 model-year vehicles. Jaguar topped the rankings in the luxury group with a score of 877, with Lexus, Audi, Lincoln and Cadillac completing the group of five highest scorers. Jaguar moved to the top, from a sixth-place ranking in 2014, because of improvement in four out of five customer satisfaction measures: initiation, adviser, facility and quality, Battaglia said. Overall satisfaction in both the luxury and mass-market categories decreased from a year earlier. The luxury brand average was 852 on a 1,000-point scale, a 3-point decline from 2014. In mass-market brands’ rankings, the average was 792, a 5-point dip from the year earlier. But overall customer satisfaction among customers who took vehicles in for recall-related repairs improved to 789 on a 1,000-point scale, up from 777 a year earlier. Satisfaction was 8 points higher for customers with a recall visit, compared to those with a repair visit, the statement said. “Even though recalls can create a large influx of customers into the service department and really strain capacity, automakers are better prepared to handle recalls than they were a few years ago,” Chris Sutton, vice president, U.S. automotive retail practice at J.D. Power, said in the statement. “Manufacturers have shown that it is possible to turn a potential negative into a positive when it comes to recalls if they’re done in a way that doesn’t inconvenience the customer,” he added. Customers prefer dealerships that offer a no-appointment-necessary express lane, Power found. More than half of customers who used an express lane reported talking with a service adviser immediately, compared with 38 percent of customers who did not use an express lane. Familiarity also plays a role in customer satisfaction, the study found. More than 60 percent of customers said they had worked with the same service adviser in the past. Customers who worked with the same service adviser they worked with in the past were substantially more satisfied than those who worked with a new adviser. Internet-based scheduling made a significant difference in customer satisfaction, Power said. Compared with phone scheduling or drop-ins, “people that scheduled service via the Internet have higher satisfaction level than any other dealer visitation method,” Battaglia said. Mainstream-brand customers who scheduled via the Internet ranked their experience 22 points higher than phone scheduling, and luxury-brand customers scored Internet scheduling 16 points higher than phone.Nearly half of customers said they were unaware that Internet scheduling is an option. Only 9 percent of customers scheduled appointments via the internet, while nearly three quarters of customers called for an appointment. Many brands in the industry have initiatives to promote Internet scheduling, Battaglia said. Fiat Chrysler’s brands finished at the bottom of the study. Peter Grady, who is retiring this month as head of FCA’s dealer network, said his one regret about leaving has been his inability to improve the customer satisfaction practices of the company’s dealers. Grady spoke to Automotive News last week, prior to today's release of the latest J.D. Power survey data. “My only regret, over the last five-and-a-half years, is that we still haven’t cracked the code on the customer experience. That’s the thing that I regret,” Grady said.